I’m honored to have Janet Stone, AKA Mama Stone, on the show this week. She’s the one who helped to demystify chanting when before I used to be afraid of it and make fun of it. 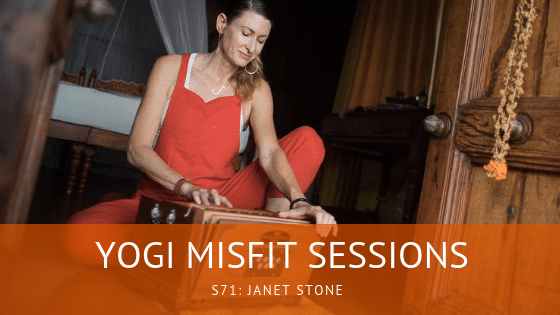 We sit down and chat about how motherhood and raising her daughters have influenced her yoga practice and her teaching, as well as how chanting is a gateway to opening within. We also talk about bhakti, the yoga of devotion, and how it calls for all of us to acknowledge all of our emotions, instead of suppressing them. Chanting in Sanskrit has a special vibrational quality with none of its previous associations you might have attached. Despite chanting to various deities, or calling forth for a certain energy, it is an invocation to draw inward and start over again, and again, and again–and it doesn’t matter if you are a singer or not. Next time you chant, see the emotional and physical changes that may arise. Tune in, and let’s sing together! FRIEND OF THE SHOW: Brett Larkin’s Online Teacher Training: Go to http://brettlarkin.com/danni to download the course brochure, and use promo code ‘danni’ when you sign up to get $100 off & my Flight School videos. WRITE A REVIEW: If you like the podcast, please leave a review or rating on iTunes! Click here for a quick and easy guide on how to leave a review on iTunes.